These are not too dense, have a wonderful texture and the buttermilk counters the sweet honey and dates. Dice peaches and combine with honey, lemon juice and cinnamon. Set aside. Sift the flours (optional) into a large bowl. Add the bran, brown sugar, baking powder, salt, baking soda and whisk to combine. In a blender add the buttermilk, honey, dates, melted butter, eggs and vanilla. Pulse to blend for a few seconds. Make a well in the center of the dry ingredients and pour in the wet ingredients. Stir to combine and make a smooth batter. 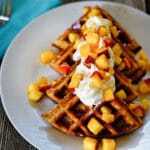 Season waffle iron with cooking spray and make waffles per manufacturer's instructions. Top with butter, peaches and whipped cream.